The Netherlands – ELC Lighting, the innovator in DMX control, networking and accessories for the professional entertainment lighting market, has announced that Production Resource Group (PRG), the world’s leading supplier of entertainment production services, has made a significant investment in its innovative ELC GBX Distribution System. 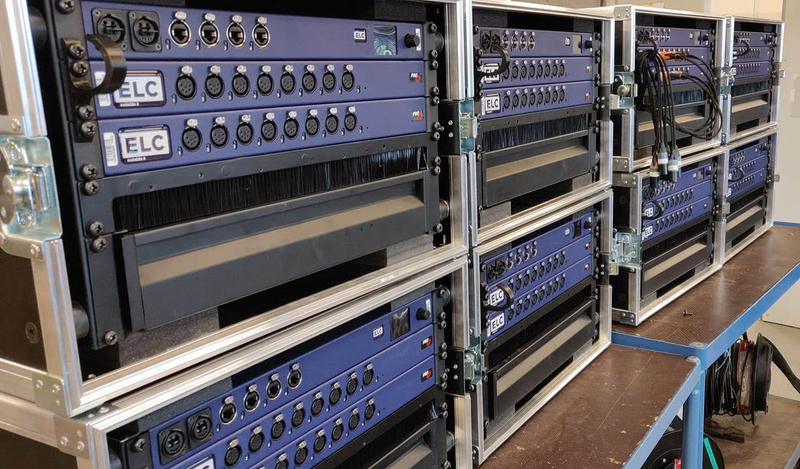 Specifically tailored for live entertainment applications, the GBX Distribution System transforms how DMX can be distributed from an ethernet network. Recognising this, PRG has purchased multiple units, including ELC’s switchGBx10 and switchGBx18 switches, nodeGBx8 nodes, and the innovative new nodeGBx8 Slave node. The new Slave node is an important part of the ELC GBX Distribution System, of which the dmXLAN switch (GBx10 or GBx18) forms the backbone. With the switch as master, up to 15 slave nodes can be daisy-chained via the ethernet ports. The slave unit serves as a substitute for a DMX splitter rack, with all DMX ports fully programmable as output, input, merge, backup and more, as node ports, meaning significant savings in hardware cost. Supporting all open protocols including sACN, Art-Net and ShowNET, the system revolutionises ethernet/DMX network distribution, and delivers major new efficiencies to the event production market. That solution included the addition of Neutrik opticalCON Advanced Duo fibre optic ports, mounted directly onto the units, as requested by PRG. The new ELC GBX Distribution equipment will be based at PRG Belgium, serving mainly the Belgian, French, Dutch and German markets, but will form a key element of PRG’s extensive global stockholding, available for transfer and use between more than 40 PRG locations worldwide.